This morning I admired the moon setting over University Lakes on my way into campus. Wait a minute, I was biking into campus by moonlight? Yep, a sure sign of field season – early mornings and long (but exciting) days. Today we headed down to Jefferson-Davis Parish to scout a couple of fields that were suffering from stand loss due to an unknown cause. In one location we are still trying to determine the cause. In the second field we scouted we confirmed a fairly severe colaspis infestation. We met with Farmer Kyle Fontenot, Consultant Ron Smith and Nicky Miller at the field which is located between Hathaway and Elton. Kyle Fontenot, Anna, Nicky Miller, and Ron Smith. Note that Kyle and Nicky were both on their iPhones connecting with me on the blog and facebook. Within a few minutes of digging we had no trouble finding many plants with colaspis larvae feeding on the roots, causing the plants to decline and eventually die. 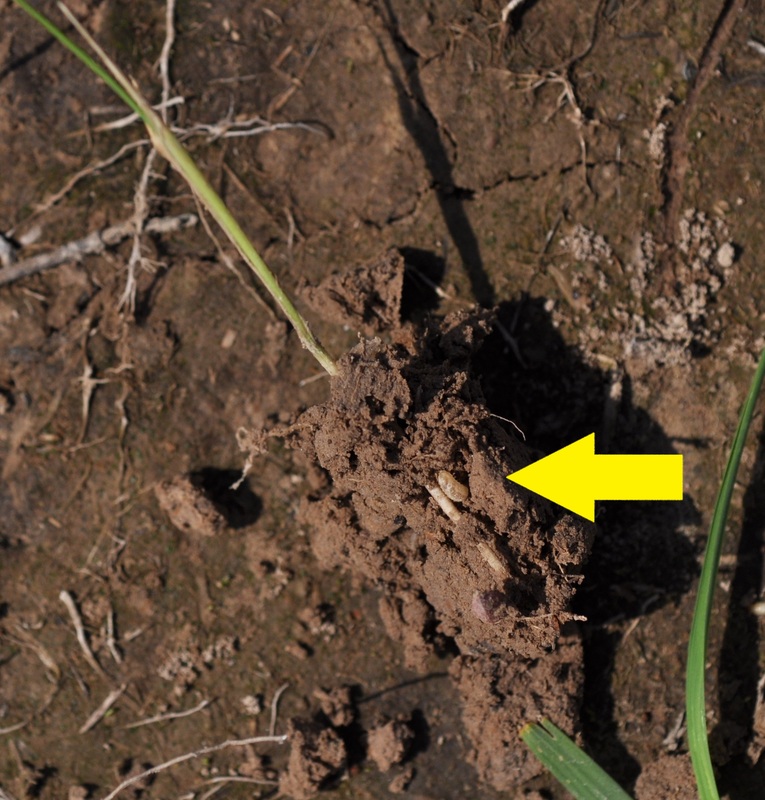 Stand reduction in a hybrid rice field that was caused by colaspis larvae feeding on the roots of the plants. 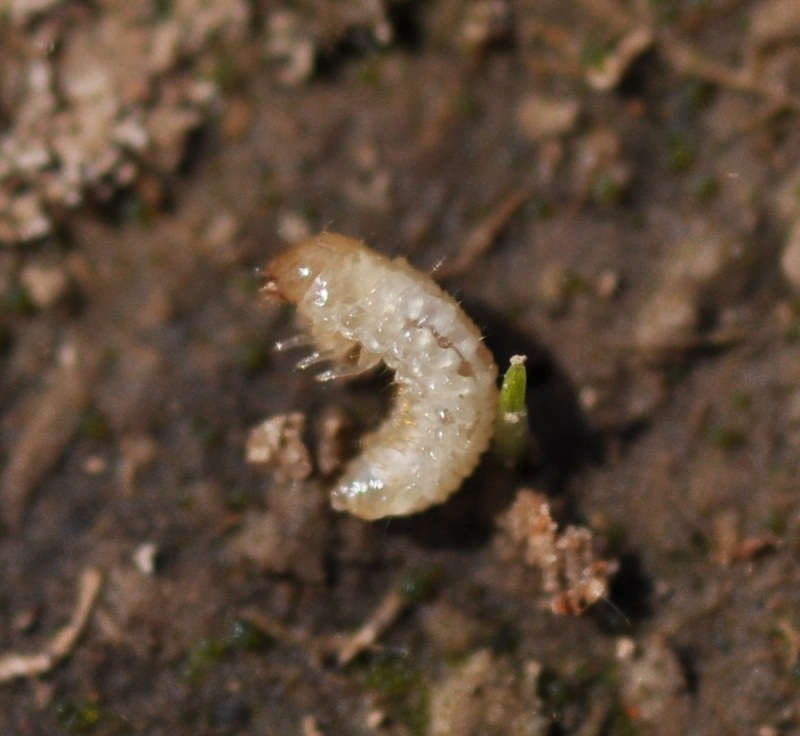 We typically found the larvae on dying plants approximately 2 inches below the soil line. 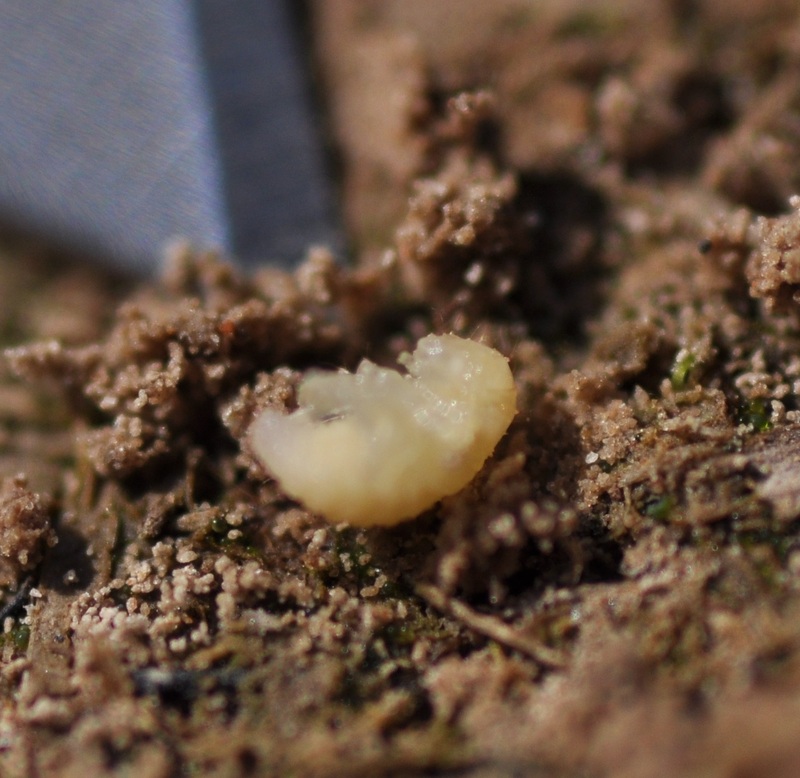 A colaspis pupa near the tip of a knife blade to give you an idea of the size. It is worth noting the history of this particular field. In 2010 it was used as cattle pasture. 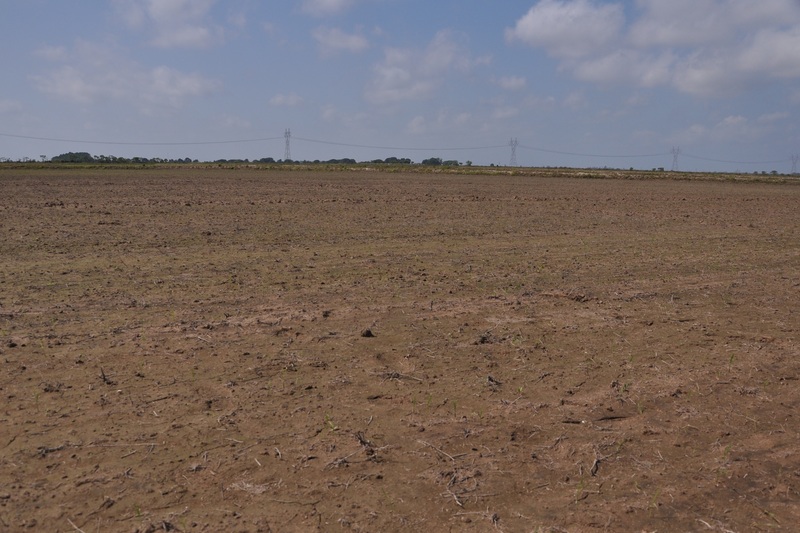 To prepare the field for rice, the farmer plowed in the fall, burned the vegetation (with fire) in December/January, then plowed again, and finally plowed, shanked, and fertilized before planting. Rice was broadcast and then packed. The planting method made it even harder to determine the cause of injury because we did not observe the typical loss of plants along a drill row that we have seen in the past with colaspis infestations. This field was planted with hybrid rice seed that was treated with Apron, Maxim, Dynasty and Dermacor X-100. Dermacor has a registration for suppression of colaspis and previous research has indicated it will provide about 40% control. It is possible the injury would have been worse without the Dermacor X-100 treatment. If CruiserMaxx or NipsitInside would have been used, then we probably would not have experienced this much stand reduction. 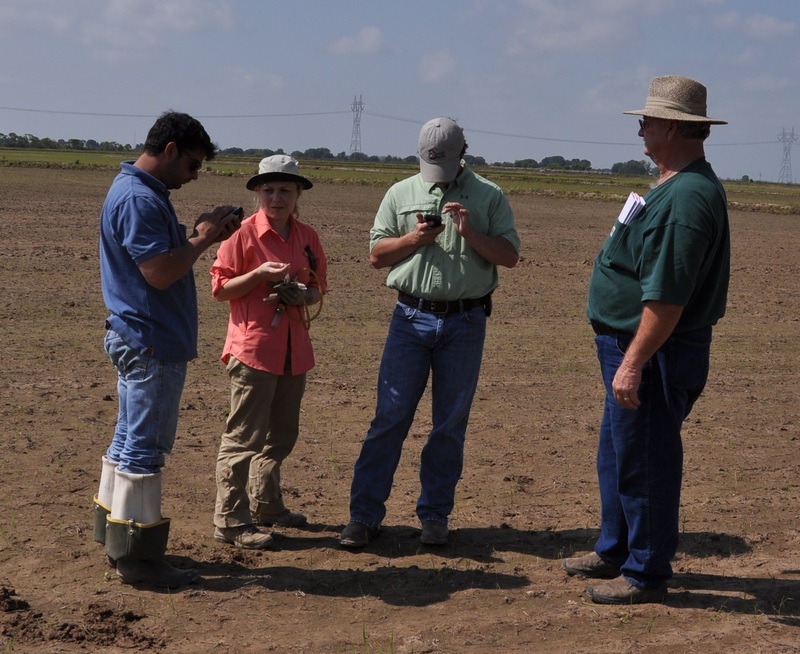 Dermacor was selected because of the history of rice water weevil pressure at the field site. It was determined that a replant was not necessary. At this point, the only option is to bring a light pin-point flood to hopefully stop the feeding of the colaspis larvae and prevent further injury of the rice. I suspect that the colaspis problems may be more widespread. After they left this field Ron Smith called to say that they also found colaspis in another nearby field. I’ll be back down that way next week to further investigate the situation. Natalie Hummel, Ph.D. LSU AgCenter Extension Entomologist. Subscribe to receive an e-mail when I update the blog.